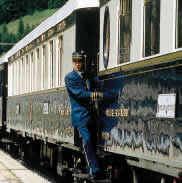 A Journey on the Orient-Express with its "Venice Simplon" & "British Pullman" together with accommodation in Castle Hotels with our special package "Castle Adventure". Carriages: each carriage has been restored with meticulous attention to detail, and finely crafted woods are complemented by gleaming brass fittings, each compartment has its own original antique wash basin: the private services are found at the end of each carriage. Compartment Bar: Mellow lighting together with original cocktails and music from the resident pianist creates the romantic mood that guarantees a perfect evening. Restaurant: offering a choice of restaurants, each unique in character and design, from its fine marquetry to its exquisite Lalique panels, tables graced with crisp white tablecloths and crystal glassware, vintage wines and finest cuisine for the most elegant of dining experiences. 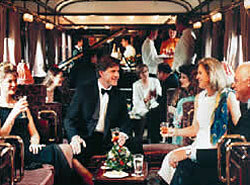 Boutique on board: Offering many original and exclusive articles: silk scarves, tie's, leather belts and other types of souvenirs each signed by Orient-Express. Baggage on Board: For your own comfort it is better to take into the cabin one overnight bag per person at the most, the larger pieces of luggage can be stored in the baggage compartment on the train and returned at the end of the journey. Extra's on board: travellers cheques and various credit cards like Visa, Diners, American Express are well accepted aboard for extra's like drinks or souvenirs. PERSONAL SERVICE A very attentive staff offering impecable service. You can enjoy the privacy of your compartment where your personal stuart attends to your every need. CASTLE-HOTELS Original authentic castles steeped with atmosphere, richly furnished with antiques and fine works of art, combined together with most modern comforts, here we propose you our "special package"
Castle Adventure Package created to make your stay even more suggestive and romantic, offering two nights in superior room with breakfast, a welcome drink on arrival, one candle light dinner the first evening and a souvenir. DRESS CODE Casual wear is ideal during the day; for the evening we recommend a simple but elegant evening dress for the ladies, while for the men it is compulsory a jacket and tie. IDENTIFICATION Individual passport with a least six months validity.